I’m happy that the Humphrey books are hardcovers. They look great, last a lot longer and – let’s be honest – I get a higher royalty. But I’m equally happy when they come out in paperback because they are more affordable. Mysteries is a title I had in my head for a long time before writing the book. I’m a mystery lover and I liked mysteries when I was growing up. There was Nancy Drew, of course! Back in the 1950s, we were still reading the originals, so Nancy wore frocks and drove a roadster. That didn’t bother me. In fact, I thought it was kind of cool. 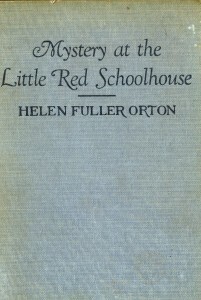 Another book I loved was Mystery at the Little Red Schoolhouse by Helen Fuller Orton. I liked reading about kids in other time periods and I also liked any book that took place in a one-room schoolhouse. My grandmother and my father attended one-room schools and I loved hearing stories about them. Somewhere along the line, I got a cheap paperback that had abridged versions of two Sherlock Holmes stories. The Red-Headed League was just so clever, it stuck with me, so I had to include it in Mysteries According to Humphrey. 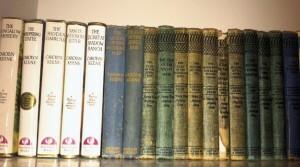 That well-loved paperback led me to a lifelong love of Sir Arthur Conan Doyle’s detective and a deeper exploration of his adventures, which you can read more about here. Happy August – a great month to read a mystery! Or at least a couple of Sherlock Holmes stories. The Dancing Men is another favorite. Eeek! Mrs. Brisbane is missing and Humphrey hasn’t got a clue what happened to her. And that’s not the only mystery Humphrey has to solve. There’s the Case of the Baffling Ballerina, the Case of the Wandering Watch and the Case of the Creepy Classroom, among many others! Yes, after what seems like an unsqueakably long wait, the eighth book in the According to Humphrey series, Mysteries According to Humphrey, is now available in the U.S.! (Available in hardcover. In the U.S., the books come out in hardcover first and then in paperback approximately a year later.) Fans in the U.K. got the book early, back in January, but the two countries have very different publishing schedules. This book follows School Days According to Humphrey (now in paperback) and is the second book featuring the “new” class in Room 26. So if you haven’t met Forgetful-Phoebe, Just-Joey, Be-Careful-Kelsey and Hurry-Up-Harry – now’s the time! And although it’s released in June, it takes place around Halloween. I’m particularly excited about this book because I have thought about using this title for a long time. 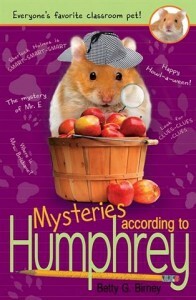 For one thing, Humphrey routinely solves little “mysteries” about human behavior, such as why Sayeh never spoke in class (World), whether a frog and a hamster can be friends (Friendship) and why was an alien from outer space was cleaning Room 26 (Surprises). But the other reason I liked the title is that I’ve long been a big fan of mysteries. Over several decades I have gone through all the Agatha Christie, Nero Wolfe, Maigret, Rumpole (not technically mysteries, I guess) and #1 Ladies Detective Agency, to name a few. My very favorites are Raymond Chandler, Dashiell Hammett and P.D. James. I haven’t just read them – I have read them over and over. As both child and adult, I’ve always been a huge Sherlock Holmes fan. (To read more about my relationship with Homes, click here.) 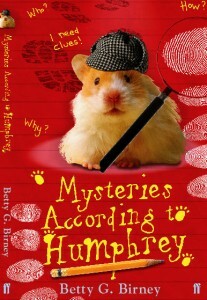 So I’m HAPPY-HAPPY-HAPPY that both the U.S. and the U.K. featured Humphrey in a deerstalker cap. 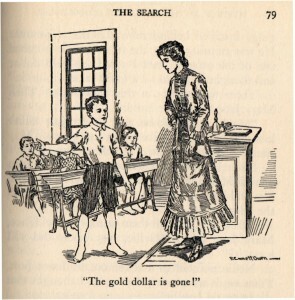 As a child, I was a big Nancy Drew fan, of course. 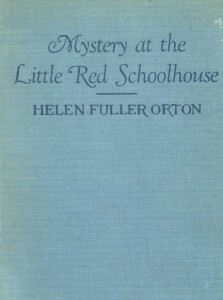 And one of my favorite books which I also reread many times was called Mystery at the Little Red Schoolhouse by Helen Fuller Orton. In fact, I might read it again today! 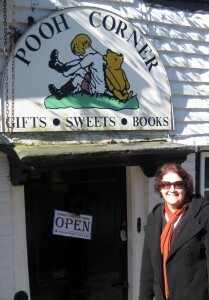 Continuing our trip to the real Pooh Corner, my friend Min and I started out at the Pooh Corner Shop in Hartfield – the door is a little on the low side. 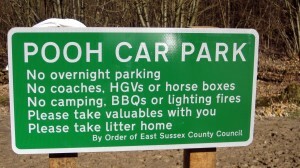 After dropping a few pounds and pence at the shop, we headed out for the Ashdown Forest. In the books, it’s referred to as The Hundred Acre Wood. But it’s actually locally known as the Five Hundred Acre Wood. It wasn’t difficult to see that we’d come to the right spot. 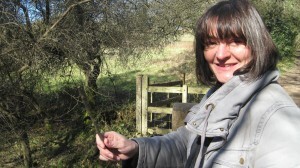 Min ready to throw her first Poohstick. I always thought it was such a silly little game. Each player throws a stick over the bridge on one side. Then players rush to the other side and watch as the sticks emerge from under the bridge and try to determine which stick wins. Well, it turns out not to be so silly at all. There’s a nice current there and we were as excited as any children as we hurried from one side to the next to watch the sticks float out from under the bridge. Only downside: Min always seemed to win! I think she’d been studying the currents. “I expect my stick’s stuck,” said Roo. “Rabbit, my stick’s stuck. Is your stick stuck, Piglet?” House at Pooh Corner. There’s a big pile of stuck sticks. 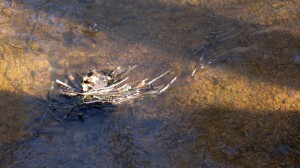 But our sticks always managed to float right past the clump of stuck sticks and on down the stream. All good things must come to an end and Min and I headed back to the car park. 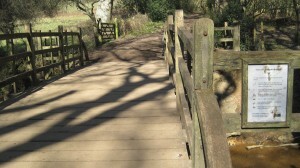 We hadn’t noticed that the walk to the bridge was all downhill. We managed to huff and puff our way uphill back to the car, still giggling over our woodland adventure. Pooh Corner friends … and me (pregnant)! It’s still strange to me to think of how much of my life has been intertwined with Winnie the Pooh. 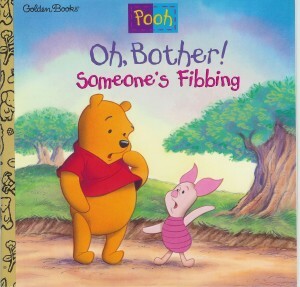 While I always had an awareness of Pooh, I don’t recall reading the books when I was a child. By the time the Disney films (and the first ones were charming) came out, I was way too old for them. I didn’t think about Pooh or bears for many years … until I was working at the Disney Studios in advertising. There was something new going on at the studio back then: a little thing called The Disney Channel. I had moved from Disneyland to L.A. with the thought that I might like writing for TV. And I knew the people involved with developing shows for the channel. I had been mentored by a much older, experienced writer/director/producer named Frank Brandt, who was freelancing at Disney. 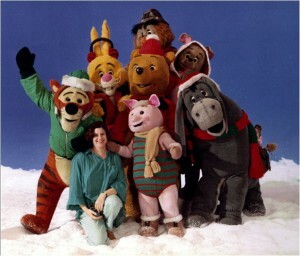 He managed to get the job of producing the first children’s show on The Disney Channel: Welcome to Pooh Corner. Not only did I know Frank, I knew the executive developing the show because we were both in a yoga class together on the lot. So when Frank ran my name by her as a potential writer for the series, she was open to it, even though I had no credit I wrote some sample scripts. They were fun … and they were well-received. Voila, I ended up writing 90 episodes, was associate producer, and my TV career was launched. Thanks to Frank Brandt and Caroline Hay! After that, I wrote over 200 episodes of children’s TV shows and won a bunch of awards, including an Emmy. And I also wrote books about Winnie the Pooh for Western Publishing. Three different series! When I was planning my trip to see friends in Caterham (Surrey) after World Book Day, I was pretty excited when Min suggested an outing to the original Pooh Corner. Pooh Corner? That’s where it all started for me! And so on a sunny March morning, we set out for Hartfield, Sussex and the beautiful Ashdown Forest. TO BE CONTINUED …. 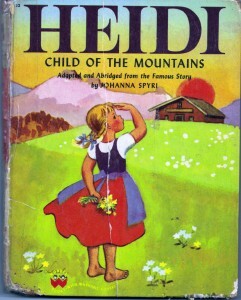 It’s not just that I liked Heidi … it’s that I loved this Heidi, as you can tell by the wear and tear on the spine. It’s another Wonder Book, which preceded the Golden Books. Even today, I have a deep affection for the illustrations. I see the illustrator was Steffie Lerch, which I never knew until now. We had some distant relatives named Lerch. A couple of months ago, the Shirley Temple film was on TCM and I was about to change the channel, thinking my husband wouldn’t be interested. But he wanted to watch – he said he’d never seen it before. I’ve seen it many times and would happily watch again. I especially like Jean Hersholt as Grandfather. But the Wonder Book version is nearest and dearest to my heart. I also have a copy of the full novel that was my father’s. His favorite book was Hans Brinker, hands down. 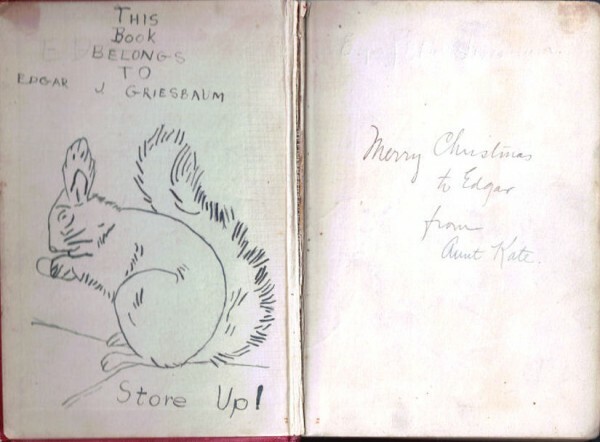 But he took the time to illustrate the inside cover of Heidi. He was always a good artist and I don’t think he was all that old when he drew this, if you judge by the printing. I certainly couldn’t do that well today! When I got to see the snow-topped Alps on a 1 day visit to Zurich en route to Greece, I thought of Heidi and the pleasure her story has always given me.